Add this issue to your photographic library for information on the Canon EOS 600D and EOS 1100D, EF 500mm f4L IS II USM and EF 600mm f4 IS II USM lenses and Speedlites 270EX II and 320EX. Plus techniques on aspect ratios, Live View, mirror lockup and lens vignetting. 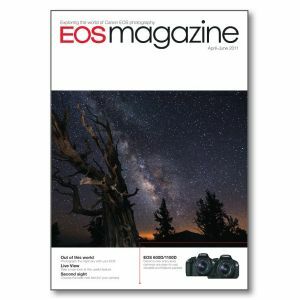 Live View This often overlooked feature on EOS cameras can be one of the most useful tools in your photographic arsenal. We look at the benefits of Live View, including control over focusing, depth-of-field and exposure. Aspect ratios Learn how to alter the relationship between the width and height of your images to improve your photos - sometimes with dramatic effect. We guide you through experimenting with different ratios when framing your images in-camera, in DPP and when printing. Lens vignetting EOS cameras offer a way of overcoming lens vignetting – a common problem which has always existed in photography. There are also times when vignetting can provide creative effects. We look at the causes, solutions and opportunities. Mirror lockup Camera shake is responsible for many spoilt images, and the vibrations created inside your camera are enough to cause problems. Mirror lockup is one solution available to help keep your images pin sharp. Choosing your next lens We look at difference types of lenses and which factors – image quality, cost and subject – might influence your decision. Shoot for the stars Even with a basic set-up, you can achieve some great images of the night skies. We show how simple it can be, and explain some more advanced techniques for the adventurous.